Connecticut Audubon Society is involved in open space issues statewide and has long been promoting better use of Connecticut’s open space for bird and habitat conservation with the state’s legislature. Detailed descriptions of novel ways to prioritize open space for habitat conservation and specific recommendations can be found in several of our annual Connecticut State of the Birds reports. In addition, our Science and Conservation office provides mission-driven conservation services for third parties in both the public and private sectors, to collect relevant biological information, to develop data-driven management guidelines and to evaluate the implementation of adaptive management strategies. Through partnerships with land trusts, towns, and other entities that hold conservation land we attempt to maximize the habitat value of individual protected parcels in the greater context of the Connecticut landscape, using Connecticut Audubon Society’s best management practices. 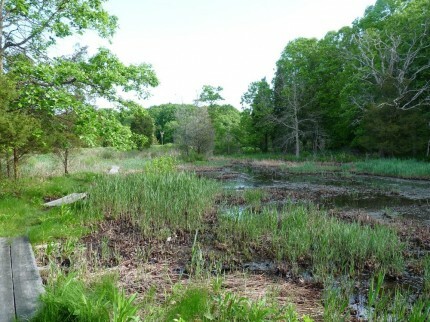 The Darien Land Trust has partnered with Connecticut Audubon Society to develop data-driven guidelines to best manage the wildlife habitat on their properties. In the spring of 2010, Connecticut Audubon Society staff, representatives from the Darien Land Trust and several volunteer citizen scientists initiated the first of a series of recurring field surveys to gather important information needed to make educated conservation and management decisions. Since Connecticut Audubon Society uses birds as key indicators for habitat quality, the first series of surveys follows Breeding Bird Survey protocol with the intent of recording bird species breeding on Darien Land Trust properties. In addition to local applications, data derived from these surveys will be available to the Society’s biologists to “fill in the blanks” on (breeding) bird distribution in this part of the state and will be shared with conservation partners to better assess the status of these species statewide. Although the primary focus of these first surveys was on breeding birds, migrants and other species of conservation concern are also noted. Science and Conservation staff educates participants in the use of standardized point count protocols which will allow for data comparison between different seasons, years and even different sites. Surveys will continue in 2011 and will gradually help build a knowledge base that benefits the Land Trust, all visitors to the properties and, ultimately, the plants, birds and other animals that inhabit the protected open space. If you would like more information on this program, please contact Milan Bull, Senior Director of Science and Conservation, or Twan Leenders, Conservation Biologist.